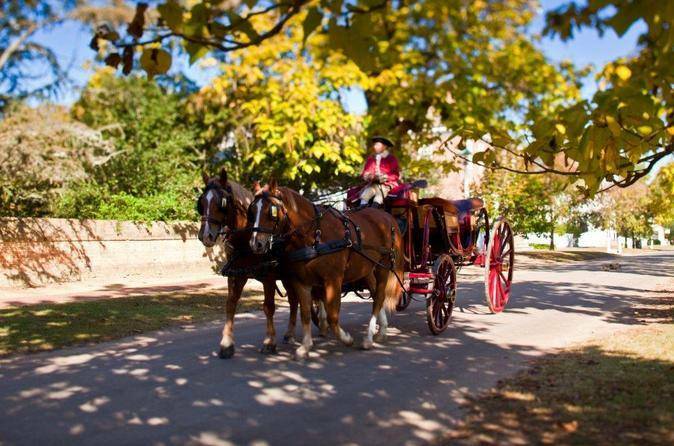 When you arrive, head to the Colonial Williamsburg Regional Visitor Center where friendly and informative staff orient you to the day's attractions and demonstrations. A variety of guided and self-guided tours are offered every day. Some programs require pre-registration, so be sure to look at the options as you plan your visit. Colonial Williamsburg’s historic area covers more than 300 acres, with 88 original 18th-century structures, plus hundreds of houses, shops and public buildings that have been rebuilt on their original foundations. Highlights include the Governor's Palace, the mansion where seven British governors lived during colonial times, followed by Patrick Henry and Thomas Jefferson; the Capitol, colonial Virginia’s seat of power; the Magazine, where weapons and gunpowder were stored for the militia; and the Bruton Parish Church, an Anglican Church from 1669 that is still active today. In addition, you can catch a performance of the Fife and Drum Corps; see the collections at the The DeWitt Wallace Decorative Arts Museum and The Abby Aldrich Rockefeller Folk Art Museum; and learn how 18th-century crafts were made in trade shops including an apothecary, silversmith, blacksmith, tailor and wigmaker. Colonial Williamsburg also boasts a number of excellent dining options as well as small shops.Choose from two of the following admission tickets, which are valid from one day to unlimited visits depending on the option. Colonial Williamsburg and the surrounding area offers so much to do and see that many people return time after time!